Going Self-Hosted and a New Look! You may have already noticed but I feel like I need to point it out – LOOK HOW SHINY MY NEW BLOG DESIGN IS!!!! The incomparable Phil at Pipdig has been my blog designer since the beginning and frankly, I have no idea what I would do without him. He is always so so helpful, even when I send him idiotic emails at 5am because my sleep deprived brain has forgotten how to use simple things like an image button or a hyperlink!I have wanted a redesign for a while, and after a few lovely campaigns recently I decided to go for it. The main change for me is that I am now self-hosted on WordPress. Up until this point I was hosted and based on Blogger, but when I looked at the changes I wanted (and by that I mean, when I emailed Phil a long un-intelligible list of what I wanted) I quickly began to see that a lot of the things I wanted, and that I knew were possible because other bloggers have them, weren’t available to me on a blogger site. So the first change for me is that I am now self-hosted, and that I’m now based on wordpress. Of course, for 90% of you, that simply doesn’t matter and you probably don’t care, but knowing how much I looked around before making the switch, a cheeky bit of advice for the bloggers still over on blogger, a wordpress migration is definitely the way to go! The sidebar is more detailed, with better links to my youtube channel and other social sites. I also have social links and a search icon in my navigation bar too which is very nifty! 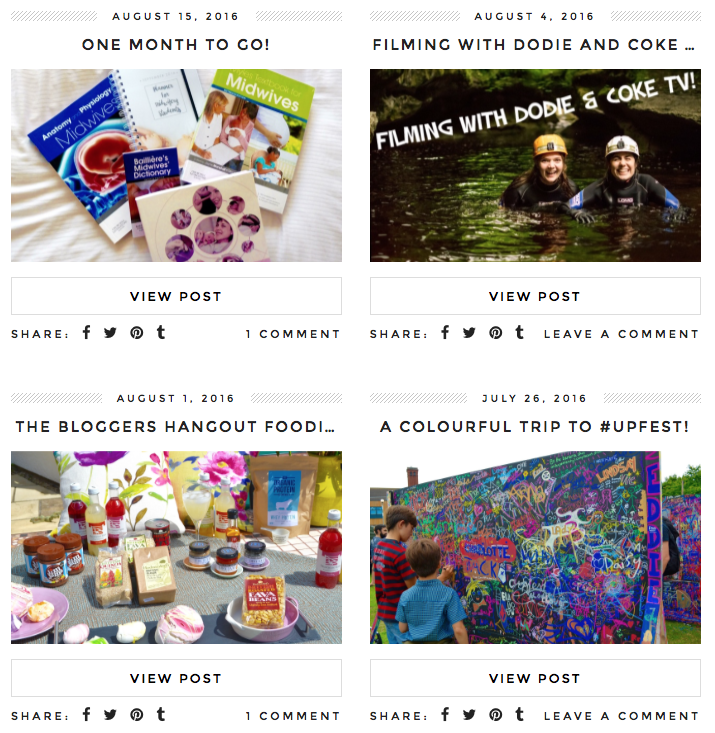 I have an instagram footer to my site, which I love but has also made me realise how much I have been neglecting my instagram recently! Upping my game immediately! And there are loads of other little things that are different – I’m really really pleased with it and I hope you guys like it too – I’m feeling totally re-inspired by the changes so expect a load more new posts over the next few months! The wordpress migration (with a pipdig theme included) is only £95 – and well well worth it! I added a few custom things too but you don’t need to, the pipdig themes are so easy to edit, even for a wordpress newbie like me, that your site will be looking unique and completely you after about 30 seconds of you playing around with it! And if you don’t want to do the playing around – ask phil – he will definitely be able to help! 10 Things To Make You Feel Miles Better At That Time Of The Month. 50 Thoughts everyone has had while flat-hunting in London. Thanks so much for the mention Rosie! I’m glad I could help you out on your new WordPress venture and that you’re finding all the theme options/widgets useful.